Thugs the world over are learning to outwit the Taser. As long as there’s more than one of you, you’re scot-free! The single-shot nature of the air Taser has always been frustrating to victims, too: once you zap a fool, you’re done! No “and here’s one for your old man” to be had there. 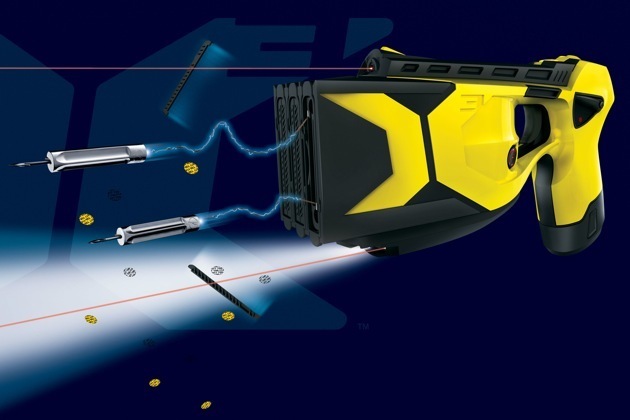 But fear not, Taser hears your cries (and the cries of those you’ve tased), for they now have created a three-shot Taser that allows for multiple attacker takedown. Or just three times the punishment for a single attacker. I see no way in which this could be a problem for anybody. In the video above, three willing participants get tased (Tased?) in the back, and the looks on their faces are priceless. The Taser X3, for so the device is called, packs enough juice to incapacitate three young women apparently, but also adjusts the voltage so no real harm is done. I don’t think anybody here believes that, but at least they’re acknowledging that harm is a distant possibility.